Single malt whisky aficionados, and particularly those who are fans of The Glenlivet, should take note as the first of the Winchester Collection finally makes it onto the shelves. 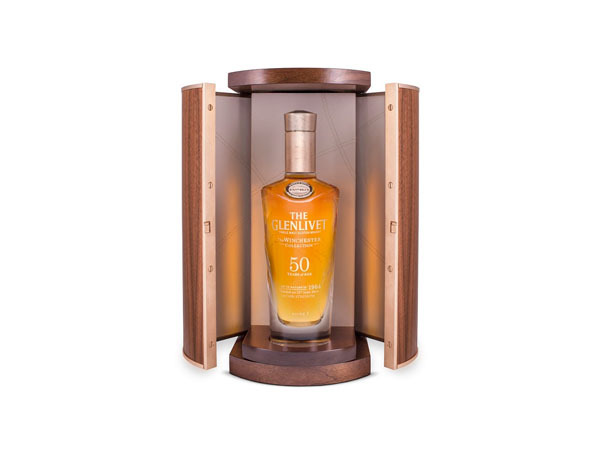 The new collection, named after The Glenlivet’s Master Distiller Alan Winchester, will be a series of exclusive 50 year old single malt whiskies for the true connoisseur. The first release, Vintage 1964 is limited to just 100 individually numbered bottles. “Bottle No. 1”, priced at £17,995, has been on sale in Harrods since October but the exquisite whisky is also due to be made available elsewhere. So just what should you expect from a whisky as old as this? Well influence from American oak that previously held bourbon is certainly at the top of the list. But pears, oranges, and black cherries are the sorts of fruit notes you’ll soon uncover in the enduring profile of this remarkably youthful blend. Of course the whisky is presented in an equally beguilling bottle. The decanter is designed by Scottish glass artists Nichola Burns and Brodie Nairn while the stopper is designed by silversmith Richard Fox using rose gold. And to keep it all safe is a presentation cabinet designed by John Galvin. This is one for keeps.